Today marks 48 years since Apollo 11 astronauts Armstrong and Aldrin took that famous small step for all of us. The grip of wonder and confusion still holds me, as it did in 1969. When we were little kids, about seven or eight, my brother and I loved to watch Lost in Space, and like all our friends, wished we were the Robinson family (I’d be Penny, my brother would be Will) hurtling through space on a critical mission to colonise other planets, only to end up lost and searching for Earth. Dr Smith was the villain we loved to hate and we roared with laughter when he called Robby the Robot a “ninny” or a “popinjay”. Hilarious! We were very young and times were simpler then, but the idea of travelling through space with our family, a nutty doctor and a robot was inordinately appealing. One reason Lost in Space rated so well was its timing. It ran from 1965-1968 bang smack in the midst of the space race (and Cold War) between America and the then Soviet Union. Space – the final frontier and all that. Russia launched the first man-made satellite Sputnik in 1957, and in 1961 cosmonaut Yuri Gagarin became the first man to go into orbit. What followed was plenty of to-ing and fro-ing between the two nations for supremacy in space. NASA decided to cut straight to the chase and land a man on the Moon. That goal became the centre of their space program, and it paid off. Only a few short years after we started watching Lost in Space, NASA’s Apollo program reached its climax when the crew of Apollo 11 – Neil Armstrong, Buzz Aldrin and Michael Collins – made it to the Moon and Armstrong and Aldrin became the first human beings to walk on the lunar surface. At lunchtime on 21 July 1969 (Australian time), my classmates and I were shepherded into the school hall to watch this history being made. The hype had been extraordinary: the mission was comprehensively covered by radio, television and the print media. It was the biggest news of the year. Seriously, it couldn’t get any bigger than this. Science fiction was becoming reality. This was actually going to happen. Men really would walk on the Moon. To add to the moment, one of my best friends had recently moved to Sydney from Parkes and told us all about the radiotelescope there, the full significance of which we probably didn’t truly appreciate until we saw The Dish thirty-one years later. It was undoubtedly the only time in the school’s history that a hall containing over 500 girls was completely silent. We were awed by what we were seeing even if we didn’t grasp the magnitude of it all. We sat shivering in that draughty old school hall, as one of the nuns fiddled with the dials on the small television set on the stage and another adjusted the rabbit-ear aerial. In these days of large screens, tablets and smart phones, it’s very hard to convey just how small and clunky that television was and how many people had to cluster around it to catch a glimpse – in blurry black and white – of Neil Armstrong getting out of the lunar module, nobly dubbed Eagle. The picture was as grainy as the sandy surface Neil Armstrong was describing on his way down the ladder, but we saw him putting his foot down on the Moon and we heard him say the words for which he will always be remembered. It was undoubtedly the only time in the school’s history that a hall containing over 500 girls was completely silent. We were awed by what we were seeing even if we didn’t grasp the magnitude of it all. It was enough that we were witnessing actual history in the making. One big thing that stayed with me was the situation regarding Michael Collins. He was in the command module all by himself for almost 24 hours, without access to any communication with Earth. None! He was in space, utterly alone. It must have been unimaginably scary. 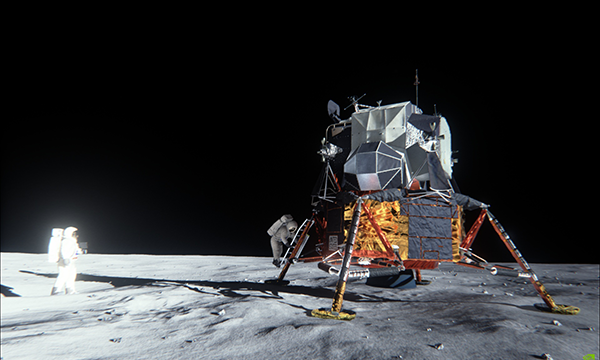 To add to it all, we learned later, there was a real possibility that the lunar module would be unable to lift off from the Moon’s surface and if it did, no one was certain whether it could make it back to the command module. The astronauts knew there was a risk of Armstrong and Aldrin literally being lost in space with Collins the only survivor, but as we know, everything went well and the Americans effectively won the space race. The fact that human beings were walking on the Moon was beyond incredible, but I vividly recall the fact that my girlfriends and I were blown away by the communication between the astronauts and the people in Houston. In those days, if my grandparents rang us in Sydney from their home in Melbourne, there’d be a frantic scramble to get Mum or Dad because we knew these calls were hugely expensive. School friends of mine had relatives in Italy and Malta – god only knew what their phone bills were like. So to think of making what amounted to a phone call between the Earth and the Moon had a profound effect on me. It sounds ridiculous now, but that’s what I recall. That week, the newspapers printed special commemorative editions with historic photos and extended commentary and my father came by a 45rpm recording of Armstrong’s words as he climbed down that ladder and into the history books. I still have that memorabilia somewhere. Like the other 500 million people around the world who watched the Moon walk, I remember that day with wonder and a sense of the grandness of human endeavour.